This year, we are commemorating the 400th anniversary of the beginning of the Thirty Years’ War (1618-1648). It was the most comprehensive, complex, devastating and brutal armed conflict in human history up to that point. 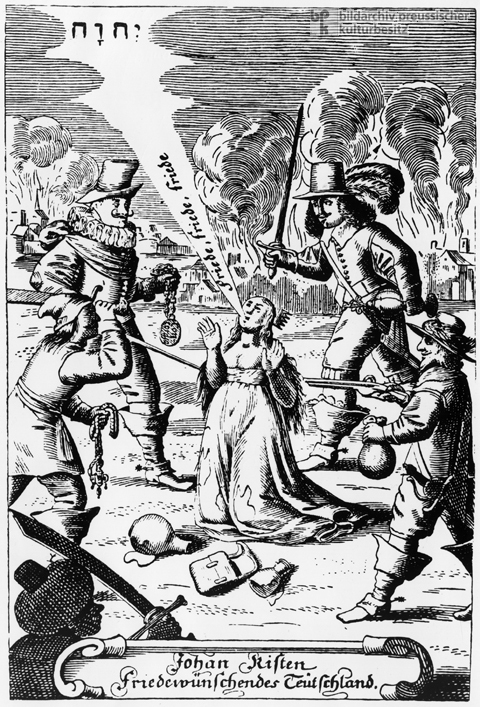 In fact, many seventeenth-century sources called it the “Great World War.” When the war began in 1618, it was primarily a conflict between Protestants and Catholics in the German Empire. The emperor and many territorial princes sought to push back the influence of Protestantism and to reclaim the territories and cities that had switched to the new faith. A second layer of conflict was what we would call the Federalism debate today. The emperor sought to consolidate his power over the territories and cities, both Lutheran and Catholic, who in turn were fiercely protective of their privileges. 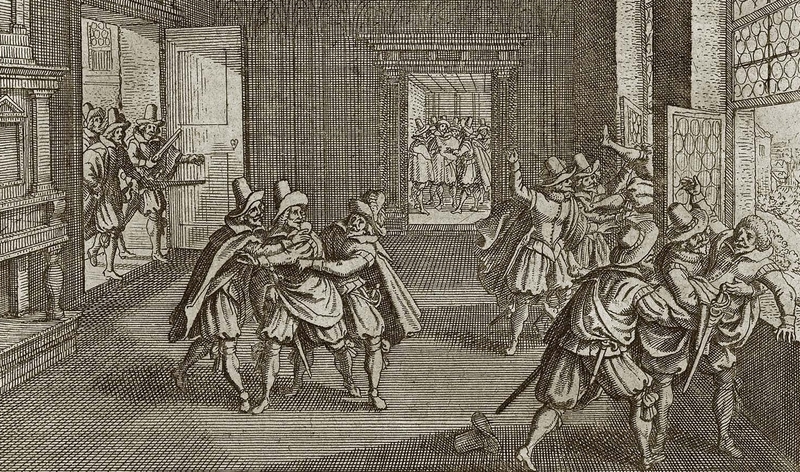 The immediate trigger for the war was the effort of the Bohemian estates to prevent the Hapsburg dynasty from establishing the dominium absolutum, that is absolutist rule, in their homeland that lead to the defenestration of imperial envoys–they literally were thrown out the window at Prague Castle. Early wins by the Catholic Emperor against Protestants led to the weakening of support from Catholic princes who feared the Emperor would use his battlefield successes to force all princes into submission, Protestant and Catholic. The third layer was the complex geostrategic context. Early territorial gains by the Emperor brought Protestant Denmark and Sweden into the war who wanted to support Protestants in North Germany. Sweden also saw an opportunity to control the Baltic coast of Germany. Catholic France supported the Protestants as well because they did everything to break the hegemonial stranglehold by the House of Hapsburg–the Hapsburgs held both the Imperial and the Spanish crowns. They also wanted to expand their territory to the Rhine river. This constellation led to a dynamic of shifting coalitions that made the war unwinnable for any side. While the Emperor was the only stakeholder who realistically could have won the war, the coalition supporting him crumbled the more successful he was on the battlefield. What resulted is one of the longest and protracted conflicts in human history. The devastation to German cities was immense, and the cost in human life immeasurable. 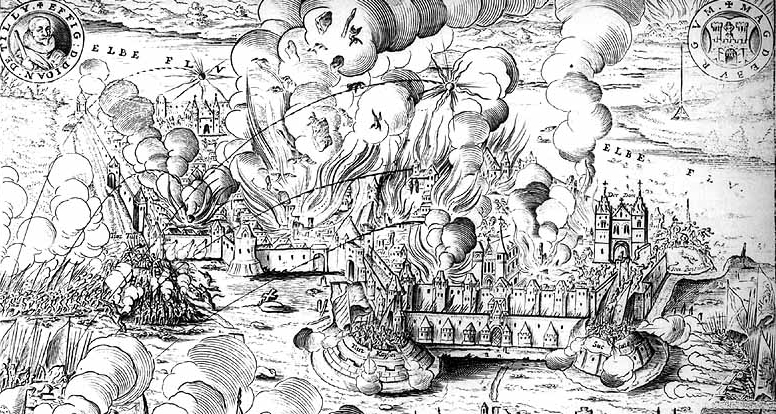 The destruction of the city of Magdeburg in 1631 was just one of many atrocities of the war. Money ran short on all sides, mercenaries did not get paid, and supply lines did not work. As a result, many regular units, but also groups of mercenaries, ransacked landscapes and raped, plundered, and killed at will. People fled where they could. Millions got killed, many more got displaced. This perhaps is the first war in European history whose victims were primarily civilians. Jacques Callot (1592-1635) showed the immense brutality of the war against civilians in his native Lorraine in his stunning series of etchings called The Great Miseries of War. What does this have to do with the brutal and complex war in Syria that arose out of the 2011 Arab Spring protests? The German historian Herfried Münkler described the Thirty Years’ War as a conflict that was very difficult to end from the outside and that military interventions from the outside usually effected the opposite of their declared intentions. In his view, the current war in Syria is a conflict of the same type. There are a large number of players in the War in Syria pursuing diverging interest and engaging in shifting alliances. The Syrian government is supported by Russia, but also by Iran and Hezbollah. Then there are a number of rebel groups who work together sometimes, and sometimes they fight each other. ISL is attempting to get a foothold in Syria. The Kurdish Front sees an opportunity to create a Kurdish state, combining territories in Syria and Iraq. The Turks, fearing a Kurdish insurgency in their own country, are fighting this effort. Israel is attacking positions in Syria periodically, as have the US in the past. There is great concern that Lebanon, Iraq, Turkey and Israel will get sucked in more deeply. As in the Thirty Year’s War, there is dynamic of shifting coalitions that make it impossible for any party to win. Furthermore, there are forces who are interested in maintaining the conflict. The Russians, for instance, want to keep the Syrian refugee crisis going in order to further destabilize the European Union, a strategy that has worked quite well so far. Just like in the Thirty Years’ War, the toll on the civilian population has been immense: millions have been killed, raped, or have lost their livelihood and were forced to flee. The city of Aleppo, a major commercial hub in the Levant for two millennia, has been mostly leveled, and now the world is watching as the city of Idlib is just about to be ground into dust. How does it all end? There is no clear path to peace in Syria at this point. The Thirty Years’ War ended because the warring parties finally recognized that victory was impossible. Germany was bled out, and there was little to gain at that point–it took Germany a century to recover from the devastation. There was a tremendous war fatigue, and there was a growing consensus that the war needed to end, no matter the conditions or circumstances. The war in Syria may have to end this way as well. But there are no signs that we are nearing this point. This entry was posted in Global Cultures of the Past and tagged Aleppo, Germany, Idlib, Jacques Callot, Johann Rist, Magdeburg, Syria, Thirty Years' War, war on September 16, 2018 by Peter Hess.